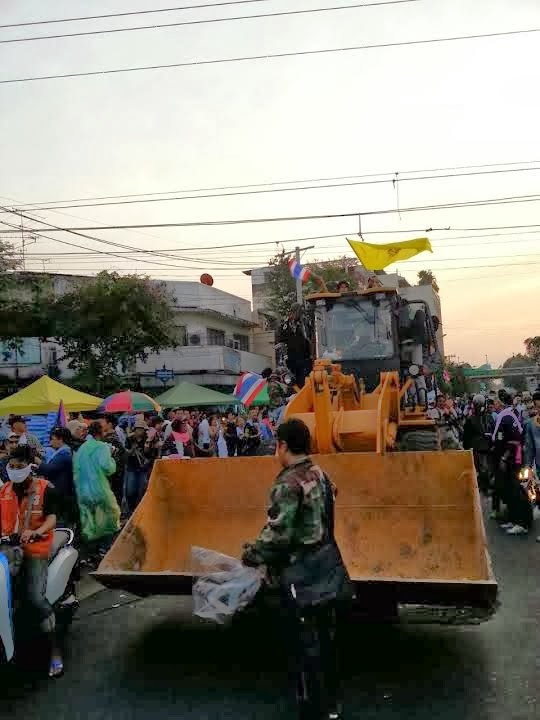 December 2, 2013 - 1820 local time (Tony Cartalucci) - Taking their cue from US-backed pro-EU protesters in Ukraine, anti-regime protesters in Thailand have mobilized their own bulldozers to remove barriers. Unlike in Ukraine, where despite the West calling the police crackdown "violent," they did not shoot protesters operating bulldozers near their lines. 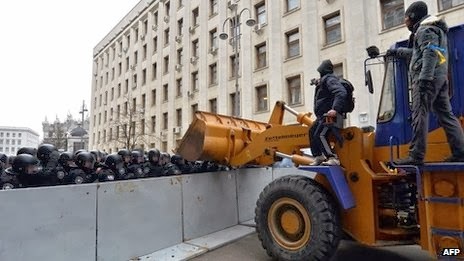 Image: Protesters in Ukraine, backed by the US, UK, and EU, have used earthmovers against police barriers in the capital city of Kiev. Ukrainian police did not use live fire on the protesters, and protesters have been allowed to storm government buildings. What little force the police have used has been utterly condemned by the West. In stark contrast, the embattled US-backed regime in Bangkok, Thailand has insisted it will shoot-to-kill any drivers attempting to remove barriers (not attack police) to gain entrance into the last of several buildings left unoccupied by protesters. Several vehicles have been mobilized by protesters near Metro Police Headquarters and Government House after protesters weathered CS tear gas, OC pepper powder, rubber bullets, and fire hoses all day as they worked police back through several rings of barriers already. Many were taken down by hand, using rope and manpower. Image: Earth-movers have arrived at Government House, Bangkok, Thailand to breach the final barricades standing between anti-regime protesters and the taking back of their nation's building. They have repeated told police they have no intention of harming them with the machinery, nor plan to harm or humiliate the police once they cross the barriers. Police have claimed they will shoot dead anyone who attempts to cross the final line. 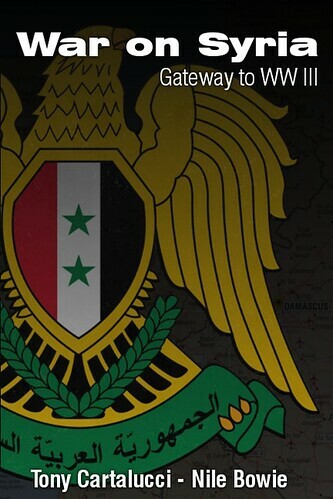 The West is suspiciously silent in light of the recent threats made by the Thai regime, whom it backs. Protesters intend to move slowly, warning police of their actions and ensuring that no body is hurt in the process. Police are adamant that they have the right to kill in order to protect their barriers, but are most likely appealing to laws dealing with the use of a vehicle as a weapon to commit bodily harm. In this case, the protesters have made it clear that is not their intentions. It is not certain yet what police and protesters will do, but one thing is for certain, the violence used by the regime's police in Thailand has eclipsed that used in Ukraine, and yet the West has been hypocritically backing the embattled regime as "democratically elected" and within its rights. Currently, a huge mass of people are poised to flow into both the Police HQ and the Government House, having reach the final barriers. The police have turned on deafeningly loud music to confuse communication amongst protesters and a clash is expected. 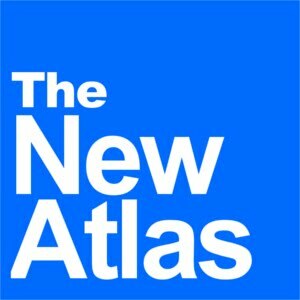 The number of people amassed outside Government House's gates have choked the streets and any move by the police at this point could cause injuries or death - solely for the sake of saving the embattled, nepotist Shinawatra regime, already with the blood of Thai people on its hands from this current crisis.